The design started as a collaborative project during the 1950s between West Germany and France, and later joined by Italy, but the partnership ended shortly after and the final design was ordered by the Bundeswehr, with full-scale production starting in 1965. In total, 6,485 Leopard tanks have been built, of which 4,744 were battle tanks and 1,741 were utility and anti-aircraft variants, not including 80 prototypes and pre-series vehicles. The Leopard project started in November 1956 in order to develop a modern tank, the Standard-Panzer, to replace the Bundeswehr's American-built M47 and M48 Patton tanks, which, though just delivered to West Germany's recently reconstituted army, were rapidly becoming outdated. On 25 July 1957, the detailed specifications were released; the new design needed to weigh no more than 30 tonnes, have a power-to-weight ratio of 30 horsepower per tonne, be able to withstand hits by 20 mm rapid-fire guns on every side as well as to operate in a battlefield contaminated with chemical weapons or radioactive fallout, the then-standard baseline for combat with the Warsaw Pact. In addition, the main armament had to consist of a 105 mm caliber weapon (the new British L7A3 105 mm gun was selected), carrying at least as many rounds as current US tank designs. Mobility had priority, while firepower came second; armour was seen as less essential, as it was believed that no real protection against hollow charge weapons was possible anyway. The Porsche Prototype II was eventually selected as the winner of the contest in 1963; this did not come as a surprise: it had already been decided in 1961 to build a pre-series of 50 vehicles based on this design; production of these was started that very year. This "0-series" was modified with a new cast turret and several hull changes to raise the rear deck to provide more room in the engine compartment, and move some of the radiators to the upper sides of the hull. Before mass production of the standard version started, it was also decided to add an optical range-finding system for better long-range gunnery, which required the turret to be somewhat taller, and added "bumps" on either side of the turret to mount the optics for triangulation. Germany dropped France from the joint program after France repeatedly missed deadlines for its contribution to the program. in February 1963 Defence Minister Kai-Uwe von Hassel announced he would soon ask the defense committee in Parliament to approve production of the tank. At this time the tank weighed 40 tons and costed $250,000 each. In July the Defence Ministry ordered 1,500 tanks with production to take place between 1965 and 1970. Germany also announced its agreement to develop a successor with the United States; called MBT-70, the program failed to materialize a tenable design. Production was set up at Krauss-Maffei of Munich from early 1964 onward, with deliveries of the first batch between September 1965 and July 1966. The Leopard was soon being purchased from Germany by a number of NATO members and other allies, including (in chronological order) Belgium (1968), the Netherlands (1969), Norway (1970), Italy (1971), Denmark (1976), Australia (1976), Canada (1978), Turkey (1980) and Greece (1981). It is also key to note that Germany has a strict export-policy for their military equipment. Greece, Spain and Chile, while still under dictatorships, purchased the French AMX-30 instead. Between 1974 and 1977, all of the machines in the first four batches were brought to the same Leopard 1A1A1 standard, and given additional turret armour developed by Blohm & Voss. A further upgrade in the 1980s added leftover image-intensifier night sights, which were being handed down from the Leopard 2 as they were themselves upgraded. The PZB 200 image intensification system was mounted in a large box on the upper right of the gun, creating the Leopard 1A1A2. A further upgrade with SEM80/90 all-digital radios created the Leopard 1A1A3. Later improvements to the image intensifier created the Leopard 1A1A4. The first 232 tanks of the fifth production batch were delivered as the Leopard 1A2 between 1972 and 1974. The A2 included a heavier and better armoured turret, and therefore did not receive the B&V armour add-ons as did the earlier machines. However, they did receive the other upgrades; the Leopard 1A2A1 received the PZB 200, the Leopard 1A2A2 received digital radios, and the Leopard 1A2A3 got both. The next 110 vehicles in the fifth batch were fitted with a new welded turret, which was equipped with a new armour consisting of two spaced steel plates with a plastic filling between them (high-hardness armour), and a wedge-shaped gun mantlet, creating the Leopard 1A3. Although the level of armour area density was equivalent to the A2's new welded version, the internal volume was increased by 1.2 m³ and the effective protection level was increased by half. The improved TRP 2A independent sight was installed for the commander. Upgrades were identical to the 1A2 models, the Leopard 1A3A1 with the night sights, Leopard 1A3A2 with the new radios, and the Leopard 1A3A3 with both. 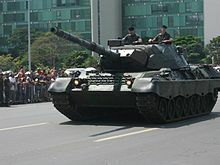 Brazilian Army Leopard 1A5 BR tank. The Leopard 1A6 prototype was a single Leopard 1 A1A1 testbed, modified with additional armour on the turret and equipped with a 120 mm L/44 gun. The project was ended in 1987, as the Leopard 2 was in widespread service at this point and the 1A5 offered a more reasonable upgrade path for a fraction of the cost. Bridgelayer "Biber" (Beaver) with armoured vehicle-launched bridge. The most well known Leopard variants are the Bridgelayer "Biber" (Beaver), "Bergepanzer 2" armoured recovery vehicle, "Pionierpanzer 2 Dachs" (Badger) armoured engineer vehicle and the "Gepard" self-propelled anti-aircraft gun. The Warsaw Pact equivalent of the Gepard is the ZSU-23-4. Marconi Electronic Systems once offered conversions to the Marksman SPAAG for existing users of the Leopard 1; the Leopard 1 chassis would be used to carry the Marksman turret. The United Kingdom's Royal Marines operate a vehicle known as the Hippo beach armoured recovery vehicle. The Hippo is a conversion of a Leopard 1A5 chassis by ALVIS Moelv. The main alteration has been the replacement of the turret with a raised superstructure that resembles the wheelhouse of a boat. The original 830 hp (634 kW) diesel engine has been retained, but the gearing of the transmission had been lowered, reducing the vehicle's road speed to 32 km/h (20 mph), but increasing tractive effort to 250 kN (56,000 lbf). Other modifications include the addition of working platforms, a nosing block, raised air intakes and an Auxiliary power unit; this has raised the weight of the vehicle from 42.5 tonnes to 50 tonnes. The Hippo has a fording depth of 2.95 m (10 ft) and can pull vehicles up to 50 tonnes weight or push off from the beach a 240 tonne displacement landing craft. When the MBT-70 program was ended, a further contract was offered under the name Boar (Eber), with an emphasis on using as many technologies from the MBT-70 as possible, but without the problematic XM150 152 mm (6.0 in) combined gun/MGM-51 Shillelagh missile launcher. Two prototype vehicles were constructed using a new chassis from Porsche with the road wheels from the MBT-70 and the original Leopard engine, combined with a new Wegmann turret mounting the MBT-70's Rheinmetall 120 mm smoothbore gun (although some also mounted the original 105 mm L7). These were considered promising enough that seven more were ordered, this time powered by the MTU engine designed for the MBT-70. When this happened, the Experimentalentwicklung team went public with their alternative design which they called the Keiler (a synonym of Eber). In 1971, the minister of defence, Helmut Schmidt, decided to abandon the Eber-project and build 17 prototypes of a Leopard 2, based on the Keiler design, which had a turret with spaced sloped armour. The maximum weight was to be 50 tonnes. During the 1973 Yom Kippur War, 1950s and 1960s generation tanks were badly beaten by wire-guided missiles, and it was realized that dramatically improved armour protection was needed. The decision was made to allow the tank to increase its weight to the next classification, Military Loading Class 60 (tonnes), and a new design effort was started, with the spaced armour replaced with a much denser perforated armour assemblage. 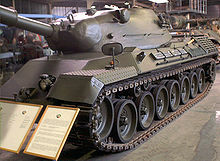 The new design would go on to augment and, after the Cold War, sometimes replace the Leopard in many countries' armies. In 1984, the Army Command decided to upgrade 132 Leopard to the A5 standard. At the end of the Cold War, there was a drastic cut in the number of tanks and 128 were sold to Brazil. The upgrade, which started in 1993, was completed in 1997. The upgrade included a new gun firing direction system with thermal imaging, laser rangefinder and a muzzle reference system. At that time, four regiments were still equipped with the Leopard 1A5(BE). At the end of the 1990s, the remaining four regiments amalgamated into two tank regiments, the 1st/3rd Lancers and the 2nd/4th Lancers. In 2010, the 2nd/4th Lancers was disbanded. Around 40 Leopard 1A5(BE) are kept operational in the 1st/3rd Lancers and Carabiniers Prins Boudewijn – Grenadiers. The 1st/3rd Lancers is no longer a tank regiment, but a medium infantry battalion, identical to the rest of the medium infantry battalions of the Belgian Army except for having a single squadron of Leopard 1A5(BE). Belgian Leopards have served in Kosovo and Afghanistan. While investigating the possibilities of increasing the Leopards' armour prior to a refit, turret armour on close-up inspection was 1.5" + turret wall cast .75" steel, 'belly' armour was approx. 2.25" + cast frame steel 0.75" steel, skirt covering treads (tracks) was 1" rubber – not steel, but additional armour was applied on the forward half of the skirt during the refit as well as increased 0.6" steel on the upper hull sides and 1.1" steel on the upper Glacis – although only a small handful of C1s received a complete refit. [clarification needed] The refit also included adding thermal night-vision equipment, five or six Leopard C1 tanks had an extremely thick MEXAS appliqué armour kit applied, made by German firm IBD Deisenroth Engineering. These tanks, designated Leopard C1 MEXAS, served with Lord Strathcona's Horse (Royal Canadians) in the 1999 KFOR mission in Kosovo. They were later upgraded with the same sights and fire-control system as the Leopard C2 (see below). Canada also operates the Leopard 1-based Beaver armoured bridgelayer vehicle and Taurus armoured recovery vehicle, bought with the original Leopard C1, and the Badger armoured engineer vehicle with a dozer blade and excavator bucket, which entered service in 1990. 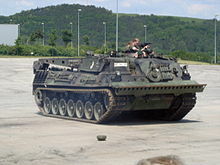 A number of the Canadian Leopard tanks were pulled out of service during the mid-2000s in anticipation of replacing them with the eight-wheeled Mobile Gun System, but these plans were put on hold after US experience revealed serious shortcomings related to stability and weight. Of the obsolescent tanks, 23 were sold to companies in North America, four put in museums or used as monuments (including two at the Bovington Tank Museum), and 21 used as hard targets on ranges. As of 2009 the Canadian Army web site list indicates that 66 Leopard C2 remain in service. On February 20, 2018 Canada attempted to sell the surplus Leopard 1C2 tanks to the Jordanian Armed Forces. In July, it was announced that the plan to sell the older Leopard tanks to Jordan fell through and the Canadian Department of National Defence has yet to decide what to do with the surplus vehicles. Italy had to replace an enormous amount of M47 Patton (over 2,000 were received by US stocks) but, unlike other NATO members, not a national project to archieve this. Its army, not entirely satisfied by the M60 Patton (300 delivered, of those 200 were produced by OTO-Melara), placed its first order for the Leopard 1 in 1970, with 200 Leopard 1A1 and 69 Bergepanzer 2 delivered between 1971 and 1972. The vehicles replaced the M47 in the Italian Army's Cavalry Brigade "Pozzuolo del Friuli". A further 600 Leopard 1A2 and 67 Bergepanzer 2 were built in Italy by OTO Melara with deliveries starting in 1975, with a second batch of 120 build by OTO Melara between 1980 and 1983. All Italian-built Leopards were A2, but without stabilyzer and skirts; the 200 A1s originally bought from Germany were partially upgraded lately at this standard. Forty Pionierleopard (AEV), nine school (for drivers, without armament) and 64 Biber (AVLB) were ordered in 1985. Twelve of the Pionierleopard were produced in Germany and 28 by OTO Melara in Italy. All of the Biber were assembled by OTO Melara in Italy. At the end, Italy was the biggest costumer of the Leopard outside Germany (920 plus 250 special versions); the only one with a licence production; the only country that produced both M60 and Leopard 1. Lastly, the Leopard was the basis for italian MBTs and heavy artillery systems, starting with Leone/Lion and the following OF-40, leading to other developements like the Palmaria and OTOMATIC artillery systems (both on OF-40 hull) . This experience made possible to develop also the C-1 Ariete, that was born because italian army decided in 1984 to have a new national tank, instead to buy 300 Leopard 2. The last A1/A2 was retired in 2003, with the last A5 going in 2008, leaving the Ariete as the sole tank in Italian service. The AEVs, ARVs, and AVLBs have been reduced in number and some have been modified to work with the Ariete. They are stated to serve for some more years, as no replacement has been selected yet. Canada – 114 Leopard C2s (updated Leopard 1A5), reduced to 66 in the early 2000s. The Leopard C2 was in active service until 2015 and replaced with Leopard 2s purchased from the Netherlands and Germany. Italy – 920 (+250 special versions), retired by the end of 2008 (replaced by Ariete main battle tank), the AEVs, ARVs and ABLVs remain in service. United Kingdom – 4 Leopard 1A5 hulls have been adapted through extensive modification to create the Hippo beach armoured recovery vehicle. ^ a b Gelbart, Marsh (1996). Tanks main battle and light tanks. Brassey’s UK Ltd. pp. 109–110. ISBN 1-85753-168-X. ^ a b Wilcke, Gerd (17 February 1963). "Bonn to Build Own Tanks Despite Pact With France; Approval Is Sought". The New York Times. Retrieved 19 August 2018. ^ [M'NAMARA HOLDS BONN TALKS TODAY; Due to Conclude Accord on Joint Tank Development. 1,500 Tanks Ordered BONN, July 30--Secretary of Defense Robert S. McNamara is expected to conclude a re search agreement here this week for the joint development of a tank to be used by the United States and West German armies in the ninetenseventies. July 30, 1963 "M'NAMARA HOLDS BONN TALKS TODAY; Due to Conclude Accord on Joint Tank Development. 1,500 Tanks Ordered"] Check |url= value (help). The New York Times. 30 July 1993. Retrieved 19 August 2018. ^ "Australian Defence Force maintains a supportable, survivable and interoperable tank capability until at least 2020". Defence.gov.au. Retrieved 2015-11-13. ^ a b Kellen Kurschinski (2014-04-10). "From Centurion to Leopard 1A2 by Frank Maas". Canadianmilitaryhistory.ca. Retrieved 2015-11-13. ^ "CTV News | Top Stories – Breaking News – Top News Headlines". Ctv.ca. 2014-05-08. Retrieved 2015-11-13. ^ "Canadian Forces to refresh aging fleet of tanks – World – CBC News". Cbc.ca. 2007-04-12. Retrieved 2015-11-13. ^ "Canadian Forces to refresh aging fleet of tanks", CBC news, April 12, 2007. ^ "Renewing the Canadian Forces' Tank Capability Archived 2008-05-14 at the Wayback Machine", Official DND/CF Backgrounder. ^ Akin, David. "Canada fails to find buyer for surplus army tanks, final attempt to sell to Jordan Armed Forces fizzles". Global News. ^ "Feu vert pour la vente d'armes belges au Liban". RTL info (in French). Mouvement pour le Liban. August 27, 2008. Retrieved 2008-12-11. ^ "Le Liban achète 71 blindés à la Belgique, dont 43 chars Leopard" (in French). MSN Actualités. December 31, 2007. Archived from the original on December 5, 2008. Retrieved 2008-12-11. ^ 13 KASIM 2009, CUMA (2009-11-13). "Tanks Improvement Project". Sabah.com.tr. Retrieved 2015-11-13. ^ "Aging Leopards Prowl The Andes". Strategypage.com. 2009-01-16. Retrieved 2015-11-13. ^ 13 KASIM 2009, CUMA (2009-11-13). "Aselsan'ın Volkan sistemi ile Leopard'lar ilk atışta vuracak – Ekonomi Haberleri". Sabah.com.tr. Retrieved 2015-11-13. ^ "Laatste schot Leopard-tank | Belgium Defence" (in Dutch). Mil.be. Retrieved 2015-11-13. ^ Harald Jacobsen hja@tv2.no (2014-10-13). "Leopard 1 har skutt sin siste granat". TV2.no. Retrieved 2015-11-13. Wikimedia Commons has media related to Leopard 1 tanks.